Our Vacationers Love Our Ocean Edge Condo!! Living Room with Large Screen T.V. 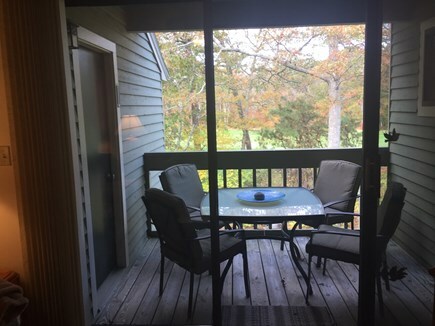 Master Bedroom w/Queen size bed and T. V.
Lovely two bedroom, two bath condo with cathedral ceiling located on the 11th hole of Ocean Edge Golf Course in Eaton Village. 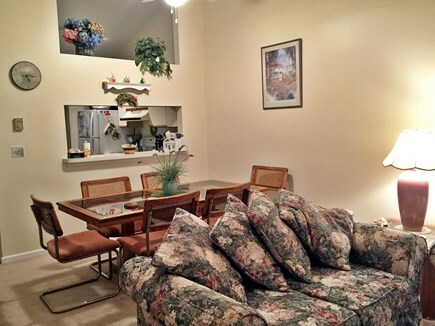 Tastefully decorated with new wall-to-wall carpeting, two TVs, DVD player with many movies, wifi, radio, alarm clocks, microwave. The master bedroom has a queen size bed and its own bathroom. 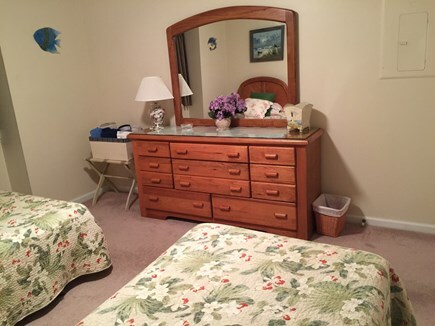 The 2nd bedroom has two twin beds and its own bathroom. 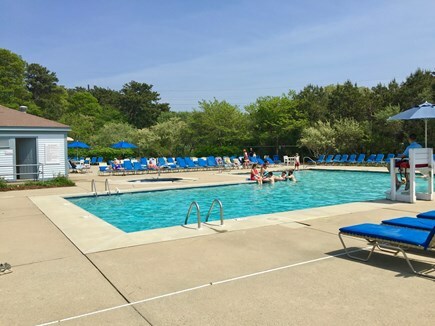 We do have a Sports membership which allows our renters to use all the pools and other sports facilities such as tennis courts, basketball and volleyball courts, access to blueberry pond to use paddle boards, canoes, and kayaks for a rental price. 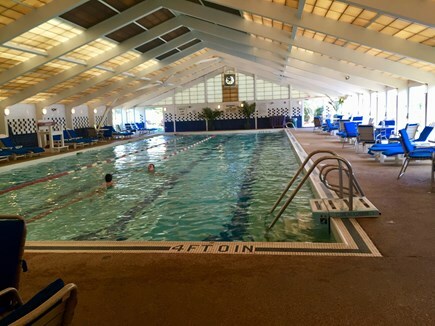 Walk to Fletcher indoor heated pool and outdoor pool and Arbor pool-both with hot tubs, tennis complex, and the golf course clubhouse with a pub restaurant. 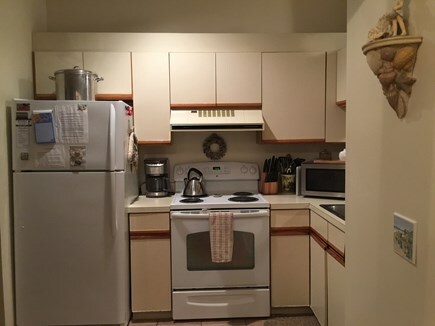 Fully applianced eat-in kitchen with a washer and dryer in the condo, new stove and oven, new refrigerator. 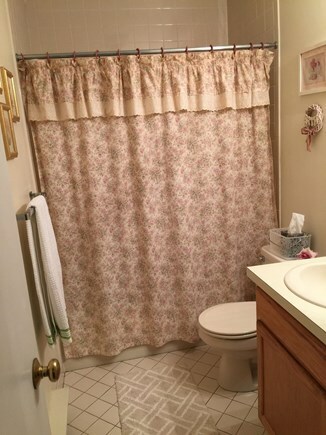 We provide all linens - sheets and towels. 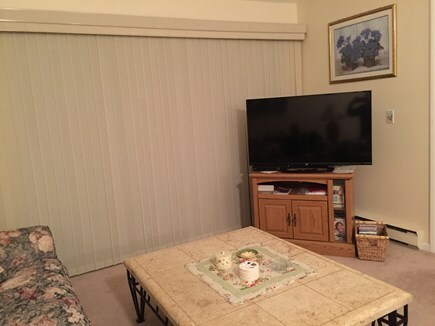 Three ceiling fans and remote floor fan, provide cool & comfortable flow of air throughout the condo. Nice balcony with table and chairs for outdoor eating. 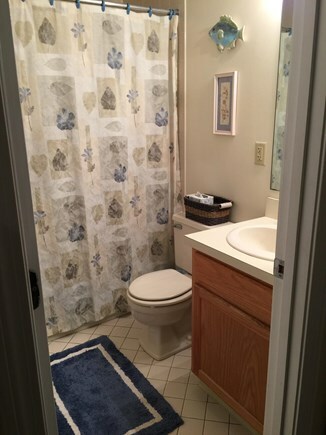 We have been renting our condo for 30 years but are new to renting on this site. There is the availability to rent kayaks, canoes, and paddle boards on Blueberry Pond, which is located within the resort. Bicycles are also available for renting with access to to the Cape Cod bicycle trail right from the resort. 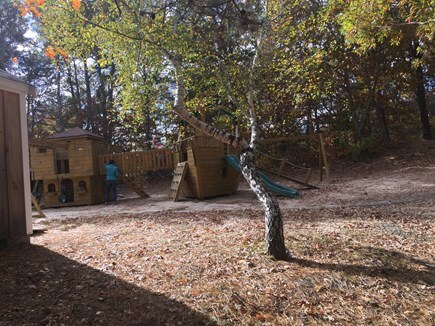 Babysitting is available for young children and there is a children's playground. Lots of organized games and events for childen. 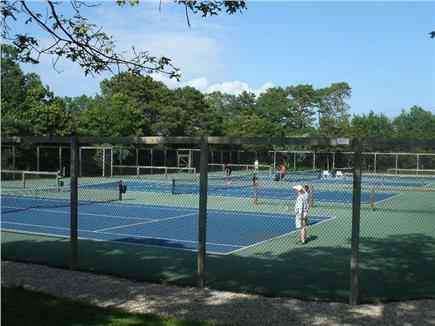 Tennis and golf lessons are available. Free shuttle bus service every 15 minutes to all pools and beaches at Ocean's Edge. Off-season rates available in September, October and November. Lovely time at the Cape. 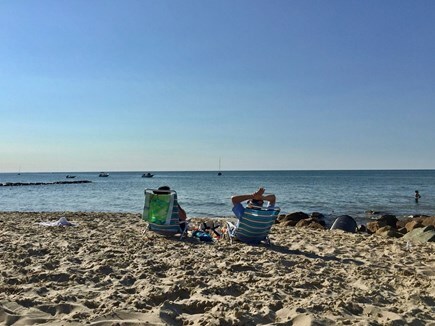 Ocean Edge is about one hour from famous Provincetown where whale watching is available as well as many other attractions such as museums, theaters, sand dune tours, walking trails, bicycle trails and shopping. Additional pricing info: IF YOU RENT 2 OR MORE WEEKS THE PRICE PER WEEK WILL BE REDUCED, State and local taxes of 14.45% will apply. We had such a wonderful vacation. The condo was so clean and had everything we needed. 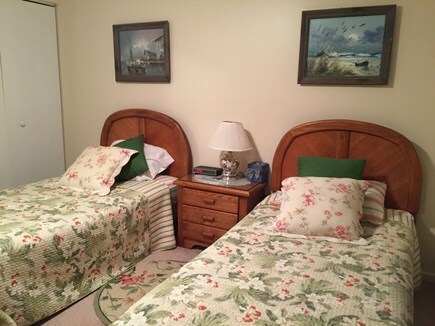 The couches and beds were very comfortable and it was so great to have a washer and dryer. The owner, Joan, was so helpful and caring. We spoke during the week of our vacation and she just wanted to make sure we were having a good time! The Ocean Edge resort is awesome! The indoor and outdoor pools were great and all the people that work there were very nice. It was a very peaceful and relaxing vacation! We didn't want to leave and hope to return next summer! 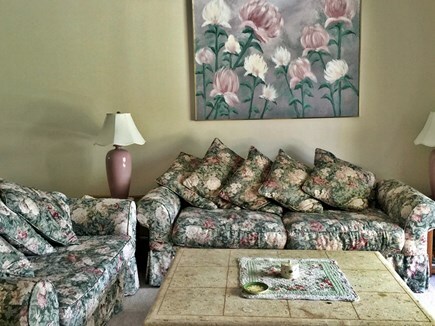 We have rented from Joan and Bill for many years. 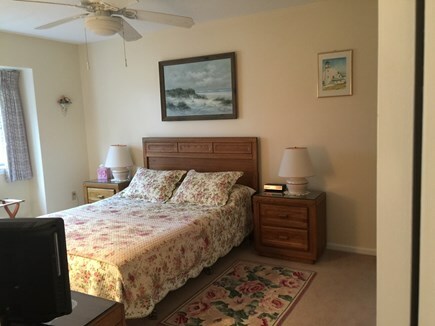 The condo is clean, comfortable, and in a great location at The Villages in Ocean Edge. It's an easy walk to the Arbor Pool, the Linx Restaurant, and Rail Trail access. Brewster bay beaches are a 10 minute drive or a short bike ride. Yet Another Fantastic Week at Ocean Edge! We have been renting our condo for many years but only rent it for about 10-12 weeks out of the year. 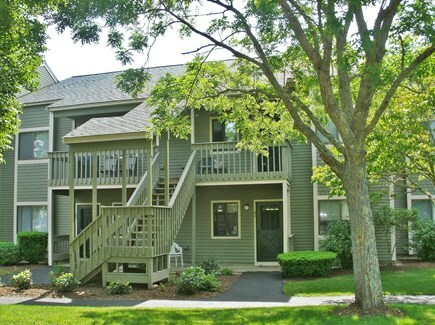 This is because it is a vacation destination for us as well as our renters as we love Cape Cod! We like to keep our ''second home'' updated and in good shape. We have been vacationing at the Cape with our children even before we bought our condo at Ocean Edge Resort. This is our second year renting through WeNeedaVacation.com and it is because they came highly recommended to us. 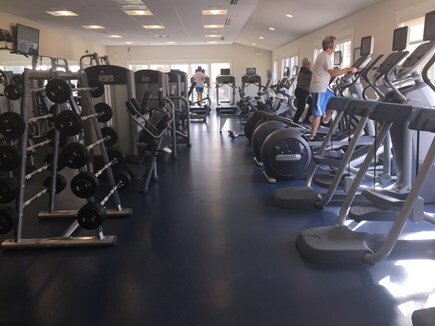 We do pay for a Sports Membership which allows our renters the right to use all the sports facilities at Ocean Edge Resort which includes the tennis courts, swimming pools, spa, volleyball, basketball courts, and other amenities the resort offers. There is a small charge to use the pools, paying either daily or a weekly fee. restaurants, one pub style and the other a gourmet restaurant outside on a large balcony overlooking the mansion complex. We are within two miles to Nickerson State Park with ''free'' fresh water ponds for swimming as well as fishing areas. 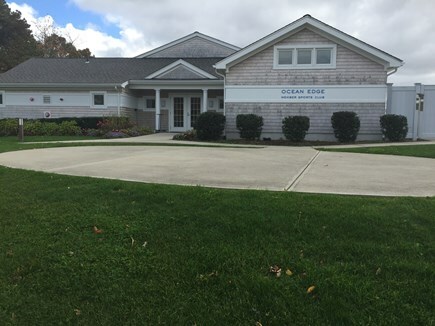 Great shopping, antique shops, museums, great restaurants available within Brewster, wonderful library with computers, movie rentals, lots of old Sea Captain's homes. Brewster owns over 800 acres of conservation land with wooded trails that pass by lakes, ponds & marshes. Great walking trails and biking trails. 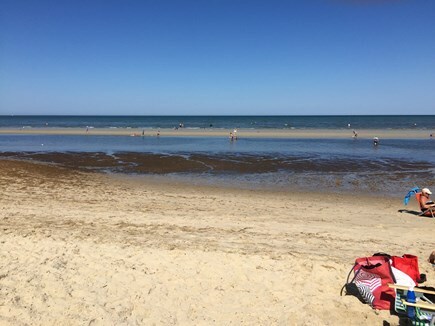 There are 7 Cape Cod Bay beach areas within Brewster alone as well as 5 fresh water ponds. Ocean Edge is about about 1/2 hour drive to the famous Province Town which is at the very end of the Cape. There is a wonderful winery in Truro just before Province Town which is available for touring and has a very nice wine shop offering for sale as well as a nice selection of gifts. We are 3.7 miles from the Cape Cod Museum of Natural History. Brewster offers a 36 hole golf course available to the pubic with a driving range and golf pro shop as well as a restaurant.